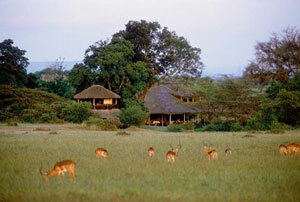 Basecamp Masai Mara consists of permanent luxury tents situated on the border of the Masai Mara National Reserve. 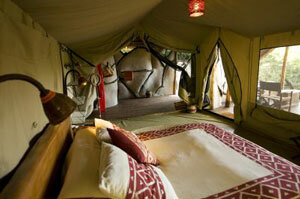 Each tent has a private deck overlooking the Talek River with an incredible view of the vast savannah. Comfort is not forgone at this luxury safari lodge, as the spacious tents each have an ensuite bathroom with a solar heated shower that opens to the sky. Meals are eaten in the wood and thatch dining room hall, which is open so guests can enjoy the breeze coming from across the savannah. This exclusive luxury Tanzania Safari camp in Kenya was named the world’s best ecotourism hotel by Skål International, the world’s largest association for professionals within the tourism industry. Being in such close proximity to the Masai Mara Nation Reserve gate, Masai Mara Basecamp provides exceptional wildlife viewing. Most of the tents are located water side and have incredible views of the plains, as well as of the Talek River, home to crocodiles and hippos. The Basecamp is ideal for adventure travelers looking for an eco friendly accommodation option. All the materials used to construct the tent were sourced locally. Guests can enjoy being close to the sights and sounds of Africa, while still being comfortable and able to enjoy a hot shower, delicious meals, and a comfortable bed. Guests can enjoy the amazing wildlife from the comforts of their tents, from the fig tree platform, or while enjoying a drink at sunset in the open air bar. The viewing tower offers incredible views of the sunset, with shadows of elephants and giraffes wandering across the plains. Basecamp Masai Mara serves delicious food, including three course dinners at night with African and international influences. Basecamp Masai Mara can also accommodate families, with a few tents being set up closer to the camp grounds for easier access. Children’s activities include butterfly catching and footprint casting. Other activity options involve the local school and a Masai women’s craft group. 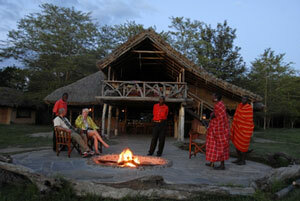 Upon arrival guests are greeting by the welcoming Masai tribe, many of whom help run the operations of the lodge. Masai Mara Basecamp works very closely with the Masai people. The camp is designed to preserve the natural surroundings, minimize carbon footprint, and ensure the benefits of tourism reach the local community. With a “Gold Eco-rated” status, Basecamp has achieved the country’s highest ecotourism designation. As part of their sustainability initiatives, Masai Mara Basecamp measures their CO2 footprint and plants trees with the local Masai people. Basecamp Masai Mara has been leading the way in providing a sustainable Tanzania Safari that protect the wildlife and nature, while also supporting the local communities and preserving their culture. Fill out a custom tour form online or give us a call at (866) 577-2462 to start planning your safari!